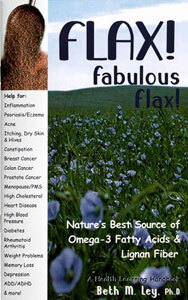 Flax seeds are nature’s best source of not one, but TWO essential dietary components most people are lacking due to diets high in refined foods: Omega-3 fatty acids & fiber! Lignans, special fiber compounds which protect against cancer, especially of the colon, prostate, breast and reproductive system. Fiber aids digestive disorders such as constipation and irritable bowel. It is also protective against heart disease and cancer. Phytoestrogens balance hormone levels and benefit pms, menopause and other hormonal disorders such as acne and depression. Omega-3 essential fatty acids aid in weight loss, help inflammatory disorders (arthritis, lupus, psoriasis, etc. ), reduce risk of heart disease by lowering elevated cholesterol and triglycerides, reducing blood pressure, thinning the blood to help ward off dangerous blood clots. Omega-3 fatty acids are also very important for the brain. Find out how to use flax seeds (recipes included!) and get on your way back to health!